Annotated Game #134: Foiled Again! I was looking forward to this fourth-round tournament game, in order to get revenge for a previous tournament loss against my opponent from Annotated Game #116. Unfortunately, even with colors reversed, the game followed a similar trajectory and my plans were foiled (again). I overestimated my chances out of the opening, missed opportunities and played more passively than necessary. A big psychological blow also occurred when I missed the opportunity to simply take a hanging piece, due to an optical illusion and time pressure affecting my calculations. Although I recovered somewhat after this, Black maintained the initiative and in the end I could not find the necessary defense against Black's kingside attack. Other than the calculation and time pressure judgment issues, the main takeaway from this analysis for me is that one should never give up. Despite everything, I had managed to equalize again on move 34 and then failed to defend properly, in large part due to feeling a sense of desperation. The psychological lesson is that a player needs to unburden themselves of previous ups and downs in a game, in order to best tackle the actual position in front of them. Annotated Game #133: What have I learned? Following the rather blah and weak second-round draw in this tournament, we come to an even poorer loss. As Black, I face my own favorite White opening, which is not easy to cope with psychologically. As early as move 5, I start losing the thread of the game, although it was really 7...Qc8 that put me in a bit of a positional hole. White misses a couple of chances to make his advantage concrete, including 12. Ne5, which would have given him a winning game. Despite this, I manage to equalize and even have a shot at an advantage myself, after bringing my queen knight back into the game authoritatively. The turning point and a swift tactical blow by White come following a big error on my 24th move that effectively puts me away. My opponent deserves full credit for correctly spotting and calculating the sequence, which includes a neat deflection tactic on h6 and f6. The big lesson for me from this game was my failure to actively falsify my opponents' moves. This was obvious on both my 11th and 24th moves, as I failed to see or consider the strong knight moves my opponent had at his disposal. (The first oversight was much simpler and therefore less excusable; I simply got lucky because my opponent also overlooked the opportunity). Since by this point I had put together my simplified thought process, this game was just an example of my lack of energy or laziness in not following what I should have learned by now. Remember: thou shalt always falsify thy moves. Fabiano Caruana's now-historic performance at the 2014 Sinquefield Cup was the topic of the previous commentary post, which featured Caruana's round 5 win in a Slav Defense, and we return for more commentary on his round 7 victory in a Stonewall. In this game, as Black he decides to start off with a Queen's Gambit Declined setup, but then takes advantage of French GM Maxime Vachier-Lagrave's sub-par development scheme to transpose into a favorable version of a Dutch Stonewall. Although White is certainly equal, Black has the easier game and clearer plans available to him. MVL stumbles in the early middlegame - something that has been a recurring challenge for myself - and Caruana masterfully exploits his opponent's mistakes, never giving White a chance to recover. On a separate but related note, this is the first game analyzed with the assistance of the Komodo 8 engine, which is getting good buzz for its performance in more positional situations. See this AoxomoxoA wondering post for more on it. Sol’s king had not escaped very far. 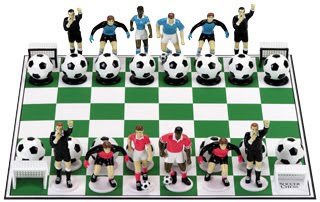 My strikers were all over the penalty box and in chess there is no such thing as offside. About three hours after our game began, it concluded in checkmate. Sol, not for the first time, spoke positively about the benefits of chess and how it put him in a different mental zone. One phase of his footballing career may be firmly over but I am sure we have not heard the last from this thoughtful man. A more fulsome comparison between the two can be found at iplayoochess.com. The performance of GM Fabiano Caruana at the 2014 Sinquefield Cup in St. Louis has been legendary. Here is a detailed look at his round 5 game against GM Hikaru Nakamura, with Caruana masterfully manuevering in a Slav Defense to obtain the win. For a previous example of White's early opening divergence with 4. Nbd2, you can also see Annotated Game #58.